A rather unique looking bronze sculpture which keeps many visitors to L'Anse aux Meadows National Historic Site in Newfoundland, Canada guessing as to what this sculpture actually represents. 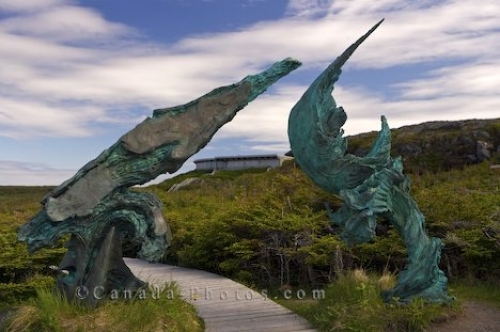 On July 5th, 2002, the "Meeting of Two Worlds" bronze sculpture was unveiled which symbolizes the meeting of the Europeans with the first permanent residents in L'Anse aux Meadows, the Aboriginal people. Picture of the unique bronze sculpture in L'Anse aux Meadows, Newfoundland named "The Meeting of Two Worlds". Her Excellency, the Governor General of Canada, Adrienne Clarkson, was honored to be able to unveil this bronze sculpture on the L'Anse aux Meadows National Historic Site in Newfoundland. Bronze sculpture titled "Meeting of two worlds" unveiled on July 5, 2002 at L'Anse aux Meadows National Historic Site of Canada and UNESCO World Heritage Site, Northern Peninsula, Great Northern Peninsula, Viking Trail, Trails to the Vikings, Newfoundland, Newfoundland Labrador, Canada.